Lash is a villain who is the primary antagonist to Queen Medusa in the early part of the series Inhuman. He represents an alternative Inhuman philosophy and leader to that of the Attilan Royal Family. Lash appears in Agents of SHIELD season 3 and is played by Matthew Willig. Lash coming to Agents of SHIELD Season 3! Lash comes from a hidden elder group of the Inhumans called the Lor tribe. that live in the city of Orollan in Greenland. The Lor do not believe that every member of their group should undergo terregenesis (the process that gives Inhumans powers) but only those who are considered worthy. Lash is a zealot of this, "Powers for the worthy only" philosophy. When Blackbolt unleashes a bomb that causes many descendants of Inhumans across Earth to undergo Terregensis, Lash is infuriated. He sets out to meet the new Inhumans and decide for himself whether they are worthy or whether they should be destroyed. He begins pulling together his chosen Inhumans and rebuilding the ruins of Orollan. His group is attacked by Queen Medusa and her followers. Medusa does not kill Lash but tells him he must stop killing Inhumans. She brings for the Inhuman Lineage who reveals that the reason Blackbolt created more Inhumans was to fight off a coming calamity. It is unclear if Lash will abide by the terms set forth by Medusa. Part of me thinks of Lash a bit like Thor's Hammer. Thor's Hammer will only be used by those it deems worthy. It cares about little else. Lash cares that new Inhumans are worthy of the powers they are given. He cares about little else. Lash can absorb and release energy. When it is released he can use it to distingrate people or objects. He can also create energy shields. He is also has been showing teleporting. Though this could be from using a device or another Inhuman's power. 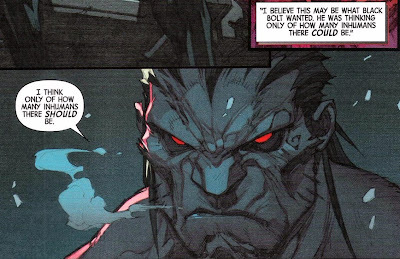 In Inhuman #3 he was able to gain some precognition that someone was going to attack Orollan by meditating. The exact nature of the ability is not clear. Appears in Agents of Shield Season 3 and is played by Matthew Willig. Willig is a former NFL offensive line man that has done work on the shows Grimm, Chuck, Brooklyn Nine Nine and NCIS.